Laughing Gull with Black Skimmer background. This image was created at Fort DeSoto Park on April 26, 2008 with the Canon 500mm f/4 L IS lens and the EOS-1D Mark III (replaced by the Canon EOS-1D Mark IV). ISO 400. Evaluative metering +1 stop: 1/3200 sec. at 4. As I had no recollection at all of this image I have no recollection as to whether I saw the skimmer enter the frame and then pushed the shutter button or if it were completely serendipitous…. Probably the latter. I am working on a folder with more than 13,000 optimized TIFFs on a 1tb external hard drive. After I get done deleting the doubles and the poor quality stuff and re-doing a few dozen images (mostly film scans) the HD will go to Peter Kes in Switzerland. He will be putting together a searchable stock site. Don’t hold your breath…. As I work my way through the images a few that I am not familiar with catch my eye. Some of them are so unfamiliar that my first reaction is often, “Did I make that image?” Today I will share with you a few of the gems that I have found. Do let us know which of the three images you like best and why. This image was created at LaJolla, CA on January 23, 2008 with the Canon 500mm f/4 L IS lens and the EOS-1Ds Mark III. ISO 200. Evaluative metering +2/3 stop: 1/2500 sec. at 4. 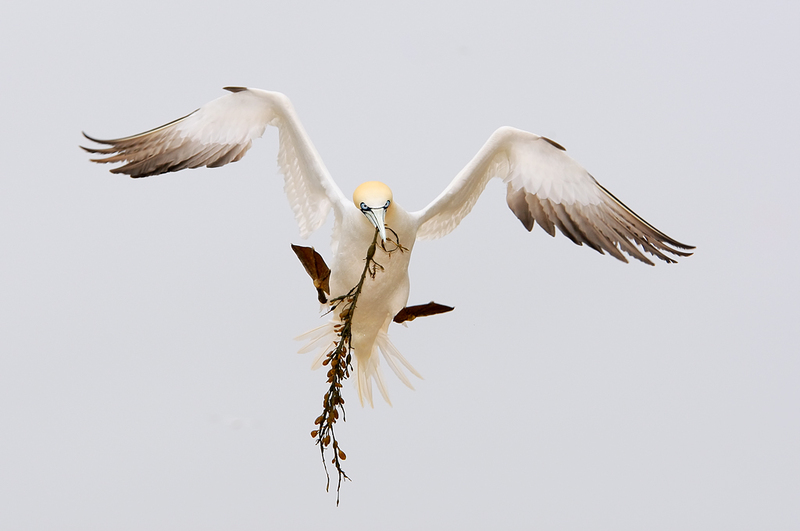 Northern Gannet with nesting material, Bonaventure Island, Quebec, Canada. This image was created with the 70-200mm f/2.8L IS lens (now replaced by the Canon 70-200mm f/2.8L IS II lens) and the 1.4X II TC (now replaced by the 1.4X III TC (handheld at 154mm) with the EOS-1D Mark III (replaced by the Canon EOS-1D Mark IV). ISO 400. Evaluative metering +1 2/3 stops: 1/1250 sec. at 6.3. Please take a minute to leave a comment and let us know which of the three images you like best and why. If you need to make a correction in what you type, the only way to do so it to use the backspace key. EOS-1Ds Mark III. Canon’s full frame professional digital camera body; ideal for landscape photography. The Northern Gannet in flight image is my favorite. I love his eye contact, wing position, tail flare, and the overall light color of the image. The position of his feet adds just a bit of goofiness, which is always fun. I liked both the Pelican and the Gannet but I like the Gannet (3rd) best. Ditto David Peller! Love the nesting material too! Artie: All three are great images, but the pelican is my favorite. I like the ocmposition, the color, and of course the bird. I wouldn’t remove the skimmer from the gull photo because it’s quite atmospheric and adds to the image. The gannet one is fascinating because one almost never sees a gasnnet doing that–I’ve been watching gannets for decades and never seen that–and its face is quite remarkable. They are among the most graceful of all fliers but the one in your image doesn’t look graceful, which adds to the interest. But the pelican is the one I’d want on a wall in my house. First, my prejudices – I like simplified, realistic watercolor paintings. I think that the gull picture is terrific, and not the least of the attractiveness is the rendering of the grass. If this picture was mine, I’d work to eliminate the skimmer – which I find distracting – crop a bit off the left side, and hang it prominently in my living room. This gem was hidden for 3+ years?? Artie #3 really appeals to me all action and head on also one of my must do species. I spend half the year in the USA and half back home in the UK we seem to have a difference of opinion in respect of positioning of subjects central or off set either side of the pond. No doubt you have covered the subject previously sorry to create repetition if that’s the case but asking questions aids my learning curve interested to hear your opinion. I agree with Jon that there is a sharpening artifact around the gull’s head. However, I had to go back and take a closer look to see it. I think my selection for the one I like best is the Northern Gannet and it may be because of my having been there and shot many many rolls of the gannets. I think they are beautiful, and it is amazing to me because they don’t have much coloration. They have just enough color on their heads and their blue eyes with “eyeliner” to make them a standout. The laughing gull is a very close second for me. While #1 is my favorite because it present a story, a community, I am always very partial to your Gannet images. 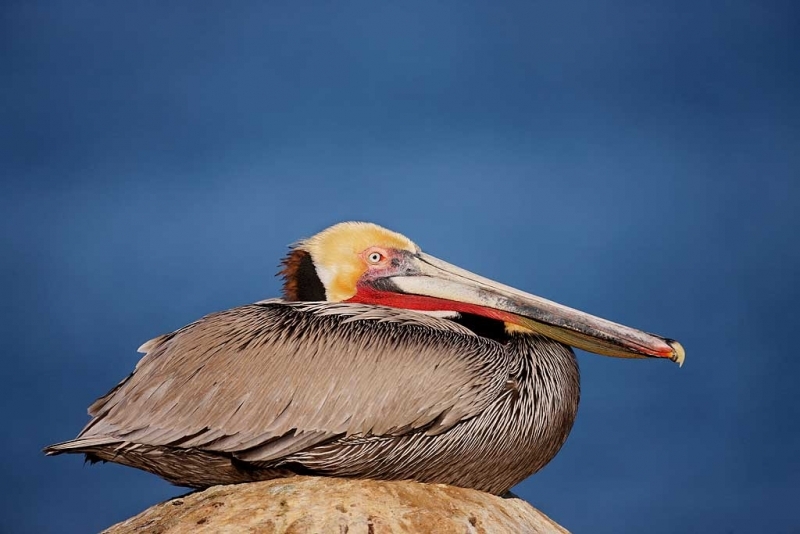 I really like the pelican in La Jolla and, in fact, hope to get out to La Jolla early next year. I like the various lines of the photo, some pointing forward, some backward…but they all give a sense of motion even in a very still photo. The Gannet image brings back a great memory because I was there when you shot it. My favorite of the 3 is the Gull. 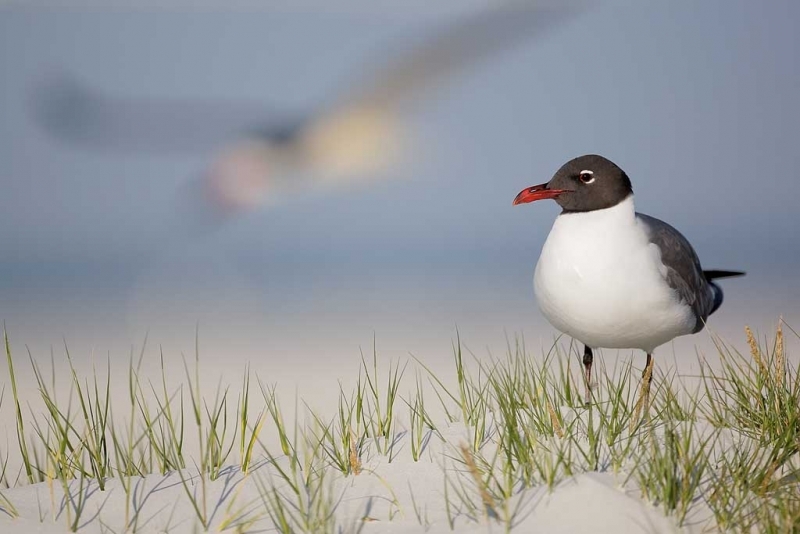 I must agree; the Laughing Gull is the best of the trio. The placement clear over to the right provides room for the Skimmer to enter the image sometime in the future, it is sharp and invokes a lovely day at the beach. I have to believe that some part of your mind was aware the skimmer was floating out there. For me it’s the Northern Gannet. When you enlarge the image and view those compelling eyes — it’s haunting. The laughing gull is a lovely shot, I would suggest however that there is a halo (sharpening artefact? )it appears round the head and bill – what do you think?